Sen. Cindy Hyde-Smith is ceremonially sworn in by Vice President Mike Pence, right, in the Old Senate Chamber at the U.S. Capitol. Holding the Bible is her husband, Michael Smith. Cindy Hyde-Smith was sworn in on Monday as the first female senator from Mississippi. Hyde-Smith, a Republican who was the Mississippi commissioner of agriculture and commerce since 2012, was appointed to succeed Sen. Thad Cochran, R-Miss., who retired due to ill health. 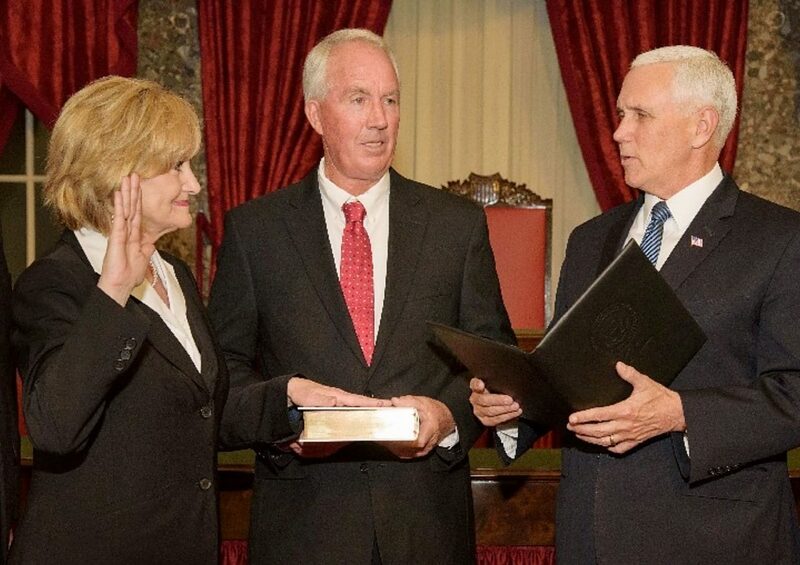 Hyde-Smith was sworn into office by Vice President Mike Pence, who also officiated at a ceremonial enactment of the process. She was accompanied by her husband, Michael Smith, and daughter, Anna Michael. Sen. Roger Wicker, R-Miss., and Gov. Phil Bryant, a Republican who appointed Hyde-Smith to fulfill Cochran's term, also participated in the ceremonies. Hyde-Smith has been appointed to the Senate Appropriations Committee, the Senate Agriculture Committee and the Senate Committee on Rules and Administration, her office said. She must run for election in November if she wants to remain in the seat.